Product prices and availability are accurate as of 2019-04-22 23:16:19 UTC and are subject to change. Any price and availability information displayed on http://www.amazon.com/ at the time of purchase will apply to the purchase of this product. 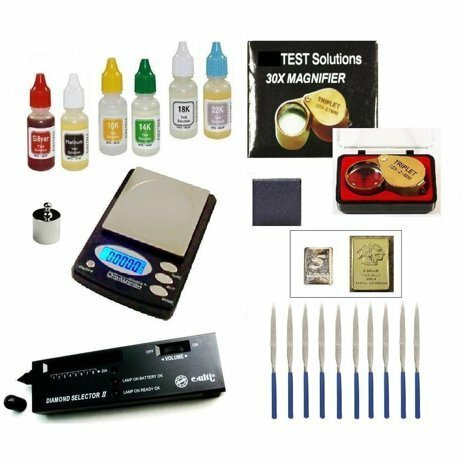 This comprehensive kit enables you to test & weigh gold, silver & platinum. Easy to follow instructions are included. Sealed box contains six (6) bottles test solution; each bottle contains 1/2 fluid oz (0.50 fl oz) test acid. You will receive one 10k solution, one 14k solution, one 18k solution, one 22k solution, one Silver solution, and one Platinum solution--each new in box sealed with shrink-wrap. 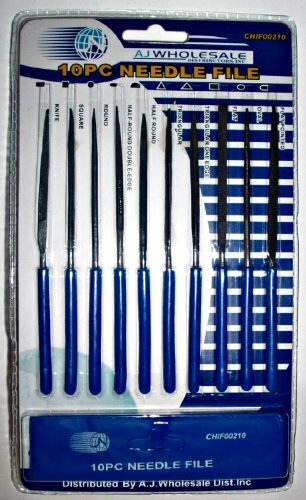 Test stone and file are brand new, and will last many uses; 10pc set of files come in assorted shapes. Test stone measures 2" x 2" (inches) diameter, and the files measures 5.5" (14cm). 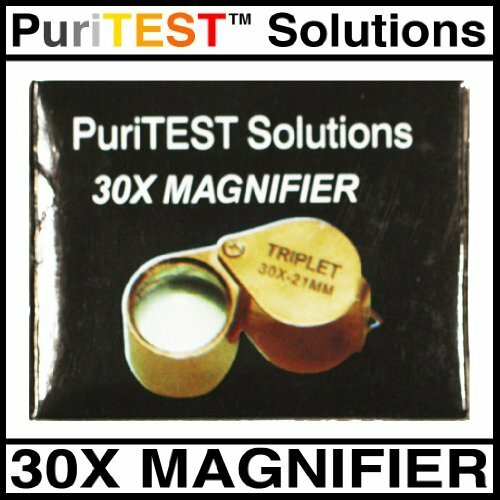 30x magnifying loupe made with top quality optical glass. Electronic diamond tester (Diamond Selector II by Culti) can distinguish diamond from white corundum and YAG. Buzzer will sound to alert you when the probe's tip touches metal. Real diamond are indicated by sound and light signal. I kindly offer 60-day money back guarantee on this diamond tester. Very easy to use. DigiWeigh 100AX jewelry scale retails for $79.00! 100 x 0.01g. Enables you to choose from Grams (g), Ounces (oz), Carats (ct) and Grains (gr/gn). Scale capacity/Accuracy: 100/0.01 g, 3.527/0.0005 oz, 500/0.05 ct, 1542.8/0.2 gr. This electronic scale is perfect for loose diamonds & gemstones, scrap jewelry, coins, small postal shipments, and much more. Use the FREE solid silver and gold, and gold-clad samples to demonstrate test/weigh procedures, or simply keep as investment. Samples include one (1) solid piece: one 5 grain (5gr) solid 999-fine silver bar, and also one (1) plated piece: a 5 gram (5g) 24k-pure gold-clad American Indian 5gr bar replica. Very easy to use. Popular among professionals, hobbyists, coin enthusiasts, business owners, and students alike. Unique Gift Idea. Excellent tools. Excellent Value.